It’s taco night, chefs! 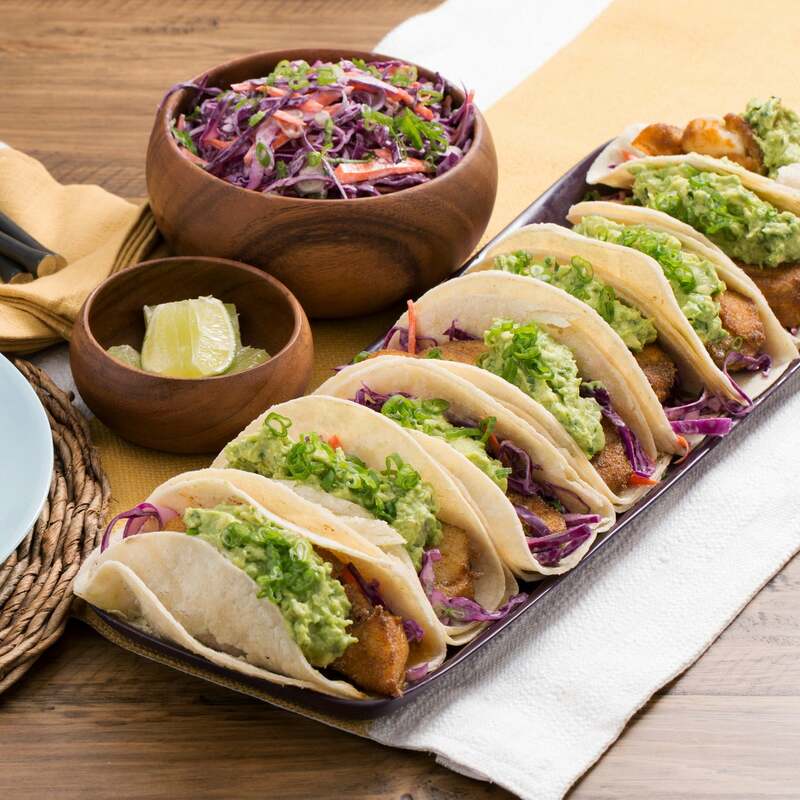 In this delicious recipe, you’ll build authentic tacos featuring crispy fish, homemade guacamole and red cabbage slaw (dressed with lime juice and Mexican crema). Among the flavors you’ll encounter in the spice blend are Mexican oregano, a robust, citrusy variety of the classic herb, and chipotle, or dried, smoked jalapeño. 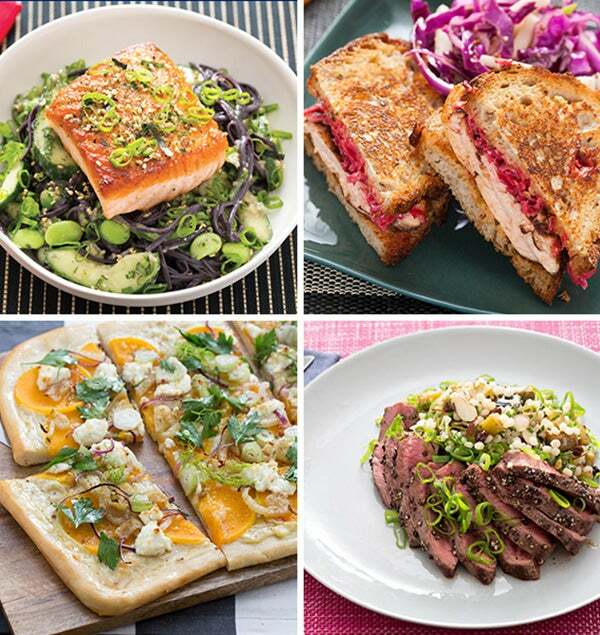 The result: a meal that’s simply bursting with vivid, traditional flavors. Preheat the oven to 400°F. Wash and dry the fresh produce. Remove the fish from the refrigerator to bring to room temperature; halve each fillet lengthwise and coat in the spice blend. Cut off and discard the root ends of the scallions; thinly slice the scallions, separating the white bottoms and green tops. Peel the carrots and cut into matchsticks. 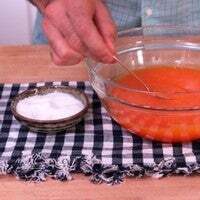 Using a peeler, remove the rind of 1 lime, avoiding the pith; mince to get 1 tablespoon of zest. Quarter both limes. Peel and mince the garlic; smash with the side of your knife until it resembles a paste. 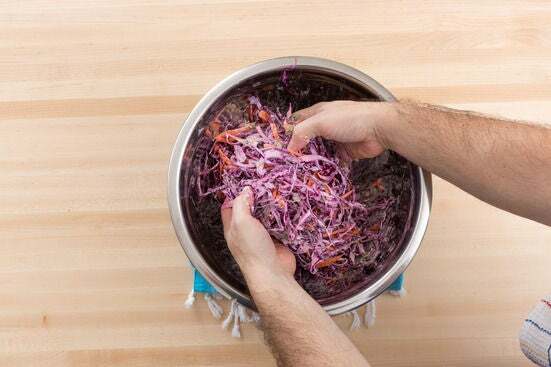 Cut out and discard the cabbage core; thinly slice the leaves. Roughly chop the cilantro leaves and stems. Stack the tortillas and tightly wrap them in aluminum foil. 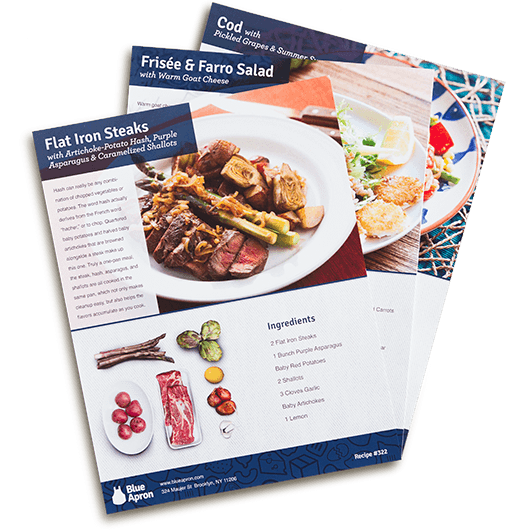 Place on a sheet pan (or directly on your oven rack) and warm in the oven 8 to 10 minutes, or until heated through. 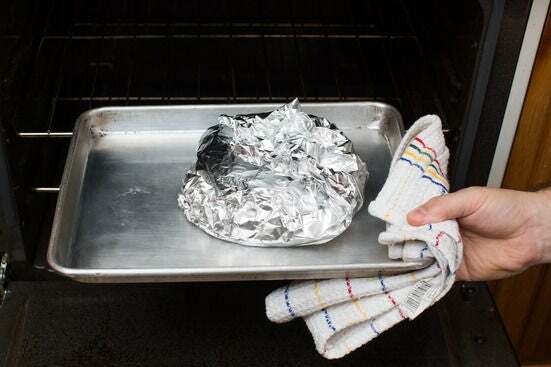 Remove from the oven and carefully unwrap. 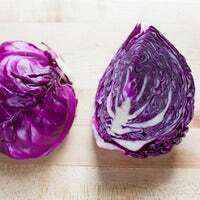 While the tortillas warm, place the cabbage in a large bowl; season with salt and toss to combine. Add the carrots, white bottoms of the scallions, Mexican crema, half the lime zest, half the cilantro and the juice of 2 lime wedges. Toss to coat; season with salt and pepper to taste. Set aside to marinate. While the tortillas continue to warm, cut the avocados in half; remove and discard the pits. 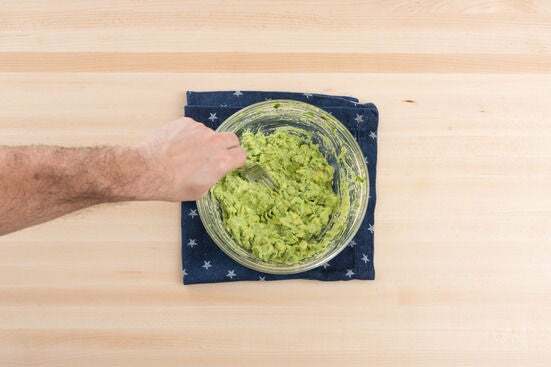 Using a spoon, scoop the avocados out of their peels and place in a medium bowl. Add the garlic paste, the juice of 2 lime wedges and the remaining lime zest and cilantro. 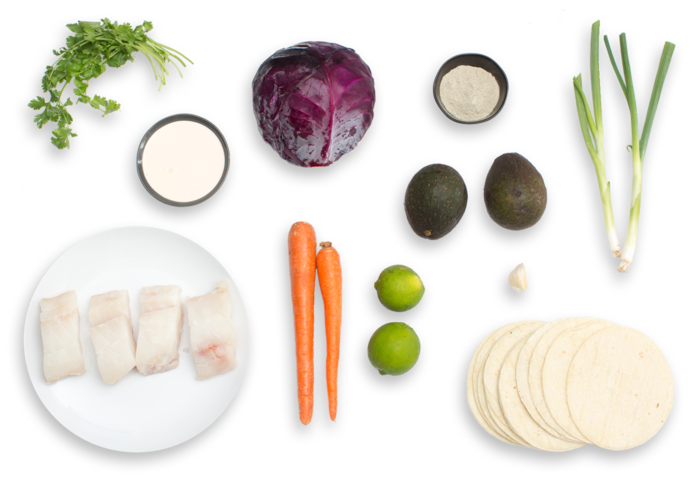 Using a fork, mash the ingredients together until well combined; season with salt and pepper to taste. Set aside. In a large pan (nonstick, if you have one), heat a thin layer of oil on medium-high until hot. 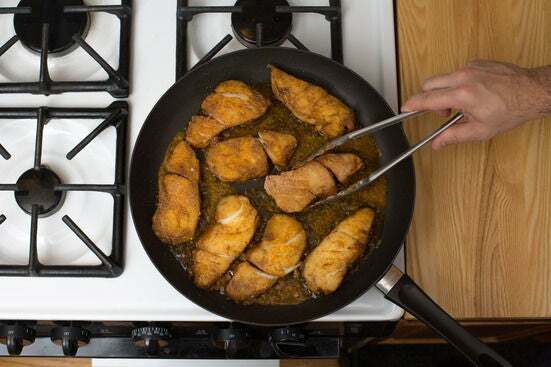 When the oil is hot enough that a piece of fish sizzles immediately when added to the pan, add the coated fish pieces; cook 2 to 3 minutes per side, or until golden brown and cooked through. Transfer to a plate and immediately season with salt. Carefully discard the cooking oil. On a serving dish, layer 2 warmed tortillas together for each taco. 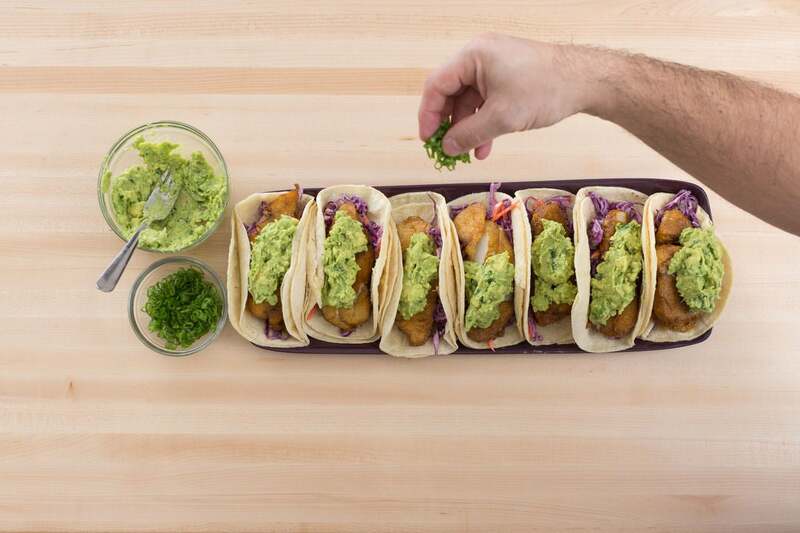 Divide the cooked fish, guacamole and slaw (you will have extra slaw) between the tacos. 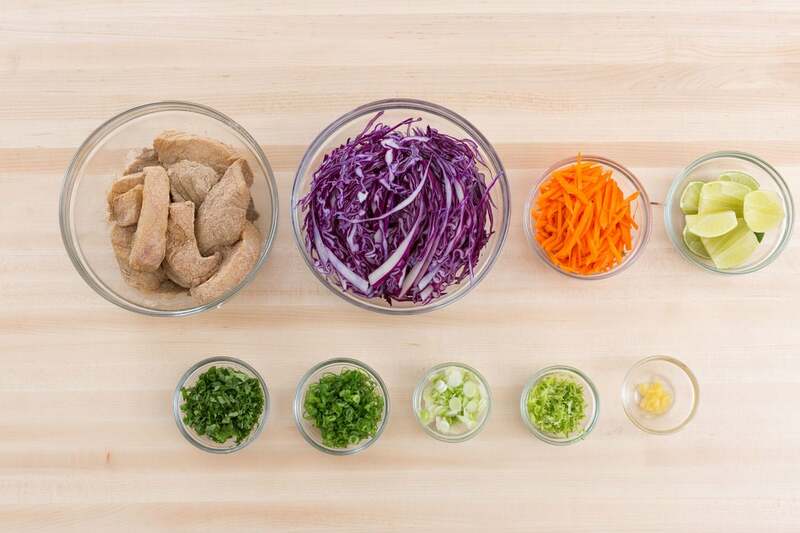 Garnish each with the green tops of the scallions. Serve with the remaining slaw and lime wedges on the side. Enjoy!